IRVINGTON Irvington Town Hall Theater “Leonard Cohen: Live at the Isle of Wight,” by Yojiro Takita. Dec. 30 at 8 p.m. $7. “Don Carlo, Verdi,” filmed opera performed at Teatro alla Scala in Milan, Italy. Jan. 2 at 11:30 a.m. $20. Irvington Town Hall Theater, 85 Main Street. (914) 591-6602; irvingtontheater.com. BREWSTER Southeast Museum “Children’s Pre-New Years Party,” craft-making activities and snacks. Ages 3 and up. Dec. 31 at 1:30 p.m. Free. Southeast Museum, 67 Main Street. southeastmuseum.org; (845) 279-7500. CHAPPAQUA Chappaqua Library “Multilingual Mother Goose.” Share and learn rhymes and songs in different languages. Ages 1 to 5. Thursday and Dec. 31 at 2:30 p.m. Both are free. Chappaqua Library, 195 South Greeley Avenue. chappaqualibrary.org; (914) 238-4779. CROTON-ON-HUDSON Croton Free Library “Let’s Pretend with Nora,” songs, movement, music and stories. Ages 1 to 4. Thursday and Dec. 31, 10:30 to 11 a.m. Free. Croton Free Library, 171 Cleveland Drive. (914) 271-6612; crotonfreelibrary.org. IRVINGTON Irvington Town Hall Theater “The Tale of Jemima Puddle-Duck and the Story of a Fierce Bad Rabbit,” giant puppet theater, based on the stories by Beatrix Potter. Presented by the Hudson Vagabond Puppets. Ages 3 and up. Dec. 30 at 2:30 p.m. $10 and $12. Irvington Town Hall Theater, 85 Main Street. irvingtontheater.com; (914) 591-6602. MAMARONECK Emelin Theater The Paper Bag Players, puppets, music and comedy. Ages 3 and up. Dec. 26 and 27. $13 and $18. Emelin Theater, 153 Library Lane. (914) 698-0098; emelin.org. MOUNT KISCO Mount Kisco Public Library “The Reluctant Dragon,” puppet theater, presented by the Lionheart Puppet Company. Ages 4 to 11. Dec. 28, 6 to 7 p.m. Free. “StoryPlay Program,” interactive storytelling activities. Ages 2 and up. Dec. 29, 4 to 5 p.m. Free. Mount Kisco Public Library, 100 Main Street. (914) 666-8041;mountkiscolibrary.org. OSSINING Teatown Lake Reservation “The Big Snow,” stories and activities about nature, animals and ecology. Ages 4 to 7. Dec. 20, 11 a.m. to noon. $5; members, free. Teatown Lake Reservation, 1600 Spring Valley Road. teatown.org; (914) 762-2912. PLEASANTVILLE Jacob Burns Film Center “The Muppets Take Manhattan,” directed by Frank Oz. Ages 3 and up. Through Dec. 27. “A Town Called Panic,” animated film by Vincent Patar and Stéphane Aubier. Ages 3 and up. Thursday through Jan. 3. “King Kong,” starring Fay Wray. Ages 5 and up. Dec. 28 through Jan. 2. “Buster Keaton Silent Films.” Ages 3 and up. Jan. 3 at 1 p.m. All are $6 to $11. Jacob Burns Film Center, 364 Manville Road. (914) 747-5555; burnsfilmcenter.org. BEACON Dia:Beacon “Zoe Leonard: You See I Am Here After All, 2008.” Through Sept. 7. “Sol LeWitt: Drawing Series.” Through Nov. 9. $7 to $10; members and children under 12, free. Mondays, and Thursdays through Sundays, 11 a.m. to 4 p.m. Dia:Beacon, 3 Beekman Street. diabeacon.org; (845) 440-0100. BEACON Fovea Exhibitions Beacon Gallery “Faith,” photographs by Christopher Churchill. Through Jan. 10. Fridays through Sundays, noon to 6 p.m. Fovea Exhibitions Beacon Gallery, 143 Main Street. (845) 765-2199; foveaeditions.org. GREENBURGH Madeleine Gutman Gallery “Graphite,” drawings by Nick Young. Through Dec. 30. Mondays through Fridays, 9 a.m. to 5 p.m. Madeleine Gutman Gallery, 177 Hillside Avenue. greenburghny.com; (914) 682-1574. IRVINGTON Irvington Public Library “Places to Linger: Landscapes of the Hudson River and Beyond,” works by Geoffrey Barbey. Through Dec. 31. Free. Mondays, Wednesdays, Fridays and Saturdays, 10 a.m. to 5 p.m.; Tuesdays and Thursdays, 10 a.m. to 9 p.m. Irvington Public Library, 12 South Astor Street. (914) 591-7840; irvingtonlibrary.org.KATONAH Katonah Museum of Art “Hudson River Trilogy: Alison Moritsugu.” “Brian Selznick’s Walt Whitman: Words for America.” “Bold, Cautious, True: Walt Whitman and American Art of the Civil War Era.” All through Jan. 24. “Steve Tobin: Katonah Steelroots.” Through Sept. 19. $3 to $5; members and children, free. Hours: Tuesdays through Saturdays, 10 a.m. to 5 p.m.; Sundays, noon to 5 p.m. Katonah Museum of Art, 134 Jay Street. (914) 232-9555; katonahmuseum.org. LARCHMONT Kenise Barnes Fine Art “Just Breathe,” oil paintings by Yolanda Sanchez, Patricia Spergel and Lisa Taliano. Through Jan. 14. Tuesdays through Saturdays, 10 a.m. to 6 p.m.; or by appointment. Kenise Barnes Fine Art, 1955 Palmer Avenue. (914) 834-8077; kbfa.com. LARCHMONT Pgartventure Gallery “Horst Janssen (1929-1995),” etchings. Through Jan. 16. Wednesdays through Saturdays, noon to 5 p.m.; or by appointment. Pgartventure Gallery, 2130A Boston Post Road. pgartventure.com; (914) 834-5100. LARCHMONT Sheldrake Environmental Center “A Closer Look,” photographs by Bill Wang. Through Jan. 8. Mondays through Fridays, 9:30 a.m. to 5 p.m. Sheldrake Environmental Center, 685 Weaver Street. (914) 834-1443; sheldrakecenter.org. MONTROSE Hendrick Hudson Free Library “Winter Warmth,” works by Ted Novak and Inge Dube. Through Dec. 30. Mondays through Thursdays, 9 a.m. to 8 p.m.; Fridays and Saturdays, 9 a.m. to 6 p.m.; Sundays, 1 to 5 p.m. Hendrick Hudson Free Library, 185 Kings Ferry Road. henhudfreelibrary.org; (914) 739-5654. MOUNT VERNON St. Paul’s Church National Historic Site “Chief Executives on the Village Green: St. Paul’s and the Presidents.” Prints, documents, artifacts, sounds and texts explore connections between five presidents and St. Paul’s. Through Jan. 1. Mondays through Fridays, 9 a.m. to 5 p.m. St. Paul’s Church National Historic Site, 897 South Columbus Avenue. nps.gov/sapa; (914) 667-4116. PEEKSKILL Flat Iron Gallery “Eclectic Illusions,” mixed-media paintings and mosaics by Doris Renza. Through Jan. 10. Thursdays through Sundays, noon to 6 p.m.; or by appointment. Flat Iron Gallery, 105 South Division Street. (914) 734-1894;flatiron.qpg.com. PEEKSKILL Hudson Valley Center for Contemporary Art “Double Dutch,” group show featuring contemporary Dutch installation and video art. Through July 26. $2 to $5; members, free. Saturdays and Sundays, noon to 6 p.m., and by appointment. Hudson Valley Center for Contemporary Art, 1701 Main Street. hvcca.com; (914) 788-0100. PEEKSKILL Paramount Center for the Arts “Interiors,” group show, produced by the Flat Iron Gallery. Through Jan. 31. Paramount Center for the Arts, 1008 Brown Street. (914) 739-2333; paramountcenter.org. PHOENICIA Arts Upstairs Gallery Works by Jean Campbell. Through Jan. 9. Fridays, 3 to 6 p.m.; Saturdays, 10 a.m. to 6 p.m.; Sundays, 10 a.m. to 4 p.m. Arts Upstairs Gallery, 60 Main Street. (845) 688-2142; artsupstairs.com. POUGHKEEPSIE Vassar College, Frances Lehman Loeb Art Center “Albrecht Dürer: Impressions of the Renaissance,” prints and terra-cotta reliefs. Through Thursday. Sunday, 1 to 5 p.m.; Tuesday and Wednesday, 10 a.m. to 5 p.m.; Thursday, 10 a.m. to 9 p.m. Vassar College, Frances Lehman Loeb Art Center, 124 Raymond Avenue.fllac.vassar.edu. ; (845) 437-5632. PURCHASE Neuberger Museum of Art “Reframing American Art,” group exhibition featuring works from the 1940s and ’50s. “Outdoor Sculpture From the Permanent Collection,” modern and contemporary art throughout the Purchase College campus. Through Dec. 31. “African Art and Culture: Selections From the Collection.” Continuing. All exhibitions $3 and $5. Tuesdays through Sundays, noon to 5 p.m. Neuberger Museum of Art, 735 Anderson Hill Road. neuberger.org; (914) 251-6100. RHINEBECK Montgomery Row Second Level “Capturing the Love” and “Dance Partners: Animals and Their People,” photographs by Alice Spears. Through Dec. 30. Hours: Mondays, Tuesdays, Thursdays and Fridays, 9 a.m. to 8 p.m.; Wednesdays and Saturdays, 9 a.m. to 6 p.m.; Sundays, 10:30 a.m. to 2:30 p.m. Montgomery Row Second Level, 6422-3 Montgomery Street. (845) 876-6670; montgomeryrow.com. SCARSDALE Madelyn Jordon Fine Art “David Kimball Anderson and Morris Graves: a Unique Pairing,” sculptures. Through Jan. 9. Tuesdays through Saturdays, 10 a.m. to 5:30 p.m. Madelyn Jordon Fine Art, 14 Chase Road. (914) 723-8738;madelynjordonfineart.com. TARRYTOWN Eyebuzz Fine Art Gallery “Public Bookstore,” group show. Through Jan. 8. Tuesdays and Wednesdays, 10 a.m. to 3 p.m.; Thursdays and Fridays, 10 a.m. to 5 p.m.; Saturdays, noon to 5 p.m.; or by appointment. Eyebuzz Fine Art Gallery, 15 Kaldenberg Place. (914) 631-1080; eyebuzzgallery.com. WEST NYACK Rockland Center for the Arts “Blessings from the Tree of Life: Jennie Chien,” sculpture. Through March 7. Mondays through Fridays, 9 a.m. to 5 p.m.; Saturdays and Sundays, 10 a.m. to 4 p.m. Rockland Center for the Arts, 27 South Greenbush Road. (845) 358-0877; rocklandartcenter.org. WHITE PLAINS Arts Exchange “Morgana Plains, from Silver to Gold,” multimedia and video installations by Wineke Gartz. Through Jan. 29. Tuesdays through Saturdays, noon to 5 p.m. Arts Exchange, 31 Mamaroneck Avenue. (914) 428-4220; westarts.com. WOODSTOCK Galerie BMG “Hibernus: A Winter Study,” photographs by David Ellingsen. Through Jan. 11. Fridays through Mondays, 11 a.m. to 6 p.m., or by appointment. Galerie BMG, 12 Tannery Brook Road. galeriebmg.com; (845) 679-0027. YONKERS Hudson River Museum “Dutch New York: The Roots of Hudson Valley Culture,” more than 250 historic objects and images from the museum and other major collections. Through Jan. 10. $3 to $5; members, free. Hours: Wednesdays, Thursdays, Saturdays and Sundays, noon to 5 p.m.; Fridays, noon to 8 p.m. Hudson River Museum, 511 Warburton Avenue. (914) 963-4550; hrm.org. LARCHMONT Watercolor Cafe Griffin House, folk. Dec. 20 at 7:30 p.m. $20. Amy Speace, folk. Tuesday at 8 p.m. $20. David Janeway Trio, jazz. Dec. 26 at 9 p.m. Free. Arcadia, jazz. Dec. 29 at 8 p.m. Free. Alan Eicher Trio, jazz. Dec. 30 at 7:30 p.m. Free. Leslie Pintchik Trio, jazz. Jan. 1 at 9 p.m. Free. Vinny Valentino Trio, jazz. Jan. 2 at 9 p.m. Free. Watercolor Cafe, 2094 Boston Post Road. watercolorcafe.net; (914) 834-2213. NEW ROCHELLE Trinity St. Pauls Episcople Church “In Celebration of Twelfth Night,” featuring the Westchester Harp Ensemble. Presented by the Thomas Paine Cottage. Jan. 3 at 5 p.m. $5 and $10; children under 5, free. Trinity St. Paul’s Episcopal Church, 311 Huguenot Street. (914) 632-5368; thomaspainecottage.org. PIERMONT The Turning Point David Roche, folk. Dec. 20 at 4 p.m. $10. MGBN Band, rock. Dec. 20 at 7:30 p.m. $15. Jimmy Vivino, Danny Louis and Felix Cabrera, rock and jazz. Dec. 26 at 9 p.m. $30. Prof. Louie and the Crowmatix, folk and blues. Jan. 1 at 9 p.m. $17.50. Michael Packer Blues Band. Jan. 2 at 9 p.m. $15. Red Molly, bluegrass. Jan. 3 at 4 and 7 p.m. $20. The Turning Point, 468 Piermont Avenue. (845) 359-1089;turningpointcafe.com. POUGHKEEPSIE Bardavon Opera House “Bronfman’s Prokofiev,” presented by the Hudson Valley Philharmonic. Dec. 20 at 3 p.m. $25 to $47. Bardavon Opera House, 35 Market Street. bardavon.org; (845) 473-5288. PURCHASE Performing Arts Center “Winter Pops,” presented by the Westchester Philharmonic. Dec. 20 at 3 p.m. $25 to $85. Performing Arts Center, 735 Anderson Hill Road. (914) 251-6200; artscenter.org. RYE Rye Nature Center “Winter Owl Hike.” Look for great horned owls and other crepuscular animals during a walk. Enjoy a post-hike fire and warm beverages. Dec. 28 at 4:30 p.m. $8 and $10. Rye Nature Center, 873 Boston Post Road. ryenaturecenter.org; (914) 967-5150. SOMERS Muscoot Farm “Winter Adaptations Hike,” learn about how woodland animals adapt to winter. Dress for the weather and wear sturdy shoes. Dec. 20, 1 to 3 p.m. Free. Muscoot Farm, Route 100. westchestergov.com/parks; (914) 864-7282. BEACON Mount Gulian Historic Site “Children’s Holiday Victorian Tea.” Dec. 30, noon to 2 p.m. $12 and $15. Mount Gulian Historic Site, 145 Sterling Street. (845) 831-8172;mountgulian.org. COLD SPRING Hudson House Inn “New Year’s Eve with Michelle LeBlanc and Tom Kohl,” jazz. Dec. 31, 8:30 p.m. to 12:30 a.m. $75 for dinner and show. Hudson House Inn, 2 Main Street. (845) 265-9355; hudsonhouseinn.com. CROTON-ON-HUDSON Van Cortlandt Manor Evening Candlelight Tours. Dec. 26. $6 and $14; children under 5, free. Van Cortlandt Manor, 525 South Riverside Avenue.hudsonvalley.org; (914) 631-8200. DOBBS FERRY Greenburgh Hebrew Center “Wonton Ball,” dance party and kosher Chinese food. Thursday, 6 to 8:30 p.m. $20; families, $50. Greenburgh Hebrew Center, 515 Broadway. (914) 693-5121.
broadwaytheatre.com. GARRISON Boscobel House and Gardens “Yuletide Teas,” holiday tours and refreshments. Every Wednesday and Sunday through Dec. 31. $20 and $40. Boscobel House and Gardens, 1601 Route 9D. (845) 265-3638; boscobel.org. GARRISON Graymoor Spiritual Life Center “Graymoor International Crèche Exhibit.” Through Jan. 31. Daily, 10 a.m. to 5 p.m. Graymoor Spiritual Life Center, Route 9. (845) 424-2111; atonementfriars.org. LARCHMONT Anelle Gandelman Fine Art “The Holiday Show,” group show. Through Jan. 16. Wednesdays through Fridays, 10 a.m. to 6 p.m.; Saturdays, noon to 5 p.m.; or by appointment. Anelle Gandelman Fine Art, 1989 Palmer Avenue. anellegandelman.com; (914) 840-4151. LARCHMONT Watercolor Cafe “New Year’s Eve with Richie Havens,” folk and pop. Includes a three-course meal and Champagne. Dec. 31 at 7 and 10 p.m. $150. Watercolor Cafe, 2094 Boston Post Road. watercolorcafe.net; (914) 834-2213. MOUNT VERNON St. Paul’s Church National Historic Site “Holiday Organ Concert,” featuring Jan Piet Knijff. Dec. 20 at 2 p.m. Free. St. Paul’s Church National Historic Site, 897 South Columbus Avenue. (914) 667-4116; nps.gov/sapa. NYACK Riverspace Arts “Neil Berg’s 100 Years of Broadway New Year’s Eve Extravaganza,” cabaret featuring Carter Calvert, Robert DuSold, Rita Harvey, Ted Levy, Andrea Rivette and Danny Zolli. Dec. 31 at 8 p.m. $27.50 to $100. Riverspace Arts, 119 Main Street. (845) 348-0741; riverspace.org. PIERMONT The Turning Point “18th Annual Home for Christmas Spectacular,” featuring Tom Chapin, Jon Cobert and Michael Mark. Dec. 27 and 28 at 7 p.m. $35. “New Year’s Eve with the Popa Chubby Band,” blues and rock. Dec. 31 at 7:30 and 10:30 p.m. $25 and $50. The Turning Point, 468 Piermont Avenue. turningpointcafe.com; (845) 359-1089. SCARSDALE Greenburgh Nature Center “Trains: Your Ticket to the Great Outdoors,” holiday exhibition of model trains, presented by the Westchester Model Railroad Club. Dec. 20. 10 a.m. to 4:30 p.m. $1 and $2. Greenburgh Nature Center, 99 Dromore Road. (914) 723-3470; greenburghnaturecenter.org. SUFFERN Cultural Arts Theater “The Snow Queen,” puppet theater based on the story by Hans Christian Andersen. Presented by the Hudson Vagabond Puppets. Dec. 20 at 2:30 p.m. $10 and $12. Cultural Arts Theater, 145 College Road. (845) 359-1006;hvpuppets.org. TARRYTOWN Tarrytown Music Hall “The Nutcracker,” presented by Les Ballets du Monde. Tuesday and Wednesday. $35 to $55. Tarrytown Music Hall, 13 Main Street. tarrytownmusichall.org; (877) 840-0457.TIVOLI Tivoli Artists Co-op and Gallery “Holiday Show and Sale.” Dec. 20. 1 to 5 p.m. Tivoli Artists Co-op and Gallery, 60 Broadway. (845) 757-2667; tivoliartistsco-op.com. TUCKAHOE Westchester Italian Cultural Center “Presepio Napoletano,” holiday exhibition. Through Jan. 5. Tuesdays, 10 a.m. to 2 p.m., Thursdays, 2 p.m. to 8 p.m. Westchester Italian Cultural Center, 1 Generoso Pope Place. wiccny.org; (914) 771-8700. WHITE PLAINS Westchester County Center “The Nutcracker,” presented by the Westchester Ballet Company. Dec. 20. $12 to $22. Westchester County Center, 198 Central Avenue. countycenter.biz; (914) 995-4050. YORKTOWN HEIGHTS Yorktown Stage “The Nutcracker,” ballet. Dec. 20. $19 to $25. Yorktown Stage, 1974 Commerce Street. yorktownstage.org; (914) 962-0606. YONKERS Hudson River Museum “9 Billion People and 1 Planet,” lecture featuring Andrew C. Revkin. Dec. 27 at 2:30 p.m. Free with museum admission. Hudson River Museum, 511 Warburton Avenue. (914) 963-4550; hrm.org. Nestled between New York's Hudson River and the Connecticut border, the magnificent estates of Dutchess County sit, decked out in true holiday style with comfortable, warm glows emanating from their Gilded Age-era rooms. These palatial homes once belonged to and hosted some of the most talked-about people of their time - Mills, Vanderbilts and Roosevelts alike. During this holiday season, visitors are welcomed into a historic celebration of the season with festivals and parades in towns and villages aglow with the holiday spirit in the shadows of these giant homes of once prominent financiers and industrialists. In addition to partaking in the festive fare at these events, you can learn to cook your own feast at one of the nation's top culinary institutions. Then, let your mind dine on the history that comes with catching a holiday performance in a historic theater that once featured Mark Twain, and see the private side of the only president elected to four terms and the only first lady with her own National Historic Site. However you spend your trip to this region, you won't be able to escape the fact that you're rubbing elbows with some of the country's richest history. Read on to discover a sampling of what the area has in store. Franklin Delano Roosevelt, the 32nd president of the United States, was the ultimate politician, considered an aristocrat for the people who offered hope in the most difficult of times. His wife, First Lady Eleanor Roosevelt, was his conscience in a political partnership that lasted 35 years, out of the Depression and into World War II. His lifelong Georgian Colonial home, Springwood, is located in Hyde Park. Both Franklin and Eleanor had private retreats where they entertained friends and world leaders. FDR's Top Cottage is open to visitors in summer. The knotty pine walls of Val-Kill, the only house that Eleanor considered her own, are lined with her treasures - photos and Christmas cards sent by friends and heads of state from around the world. Nikita Khrushchev, Winston Churchill, and her 29 grandchildren from the 19 marriages of her 5 surviving children were among her guests. Springwood remains as it was when he died in 1945. The adjacent Presidential Library and Museum, designed by FDR in Dutch Colonial style, houses a wide range of exhibits on Franklin and Eleanor's personal and professional lives and is the only one used by a sitting president. Franklin, Eleanor and their Scottish terrier, Fala, are buried in his mother's Rose Garden on the property. FDR's cousin and confidante, Margaret "Daisy" Suckley, lived in picturesque Rhinebeck. The Suckleys were descendents of the Beekman and Livingston families and had made their fortune in the export trade and real estate. The family villa, Wilderstein in Rhinebeck, N.Y., was rebuilt as an elaborate Queen Anne Victorian with an impressive porte-cochere, sprawling veranda and spectacular views from its five-story circular tower. It is filled with exceptional furnishings, art, books, letters and photographs, including about 1,400 pieces of clothing dating to the 18th century. Daisy traveled extensively with FDR during his presidency. She gave him his black Scottish terrier and wrote an account of the dog's life, "The True Story of Fala." She was an archivist for the presidential library and was with the president when he died in 1945. Letters they exchanged were discovered here in an old suitcase and edited by Geoffrey C. Ward for his book "Closest Companion." The restored first floor is open to visitors. A velvet dress found in the home and displayed for the holidays is thought to have belonged to Lucy, the daughter of Samuel Morse. The Livingston family built Locust Grove and sold it to the Montgomery family, who later sold it to Samuel Morse, artist and, most famously, the inventor of the telegraph. Morse remodeled it into a Tuscan villa with a four-story tower facing the river. He lived there with his much younger second wife, and second cousin, Sarah, a deaf mute. Morse was a talented itinerant painter whose first wife died suddenly. By the time he received the news and rushed home, she had been buried. He went on to make his fortune with the telegraph and Morse Code, a faster way of communicating messages across the miles. After his death in 1872, the family sold the property to William and Martha Young, who recognized its historic significance, collected period furnishings and art from around the world, and preserved the house as it had been in Morse's lifetime, and his art and inventions are on exhibit in the home's visitor center gallery. Christmas trees in each room of the home showcase passages from the classic "T'was the Night before Christmas," written by a Hudson Valley native, Clement Clarke Moore. Darius Mills amassed a fortune as a merchant in the California Gold Rush of 1849 and went on to become the most successful banker in Sacramento and a railroad magnate for the Comstock Lode. Regarded as the most brilliant businessman of his time, the family gained a pedigree when son Ogden married the aristocratic Ruth Livingston. When Ruth inherited a Greek Revival mansion with a mere 25-rooms, they remodeled it into an opulently furnished 79-room Beaux Arts mansion with every amenity. It took 24 servants - European, of course - including a butler, chauffeurs, maids, footmen, a valet, cooks, and a French pastry chef to run Staatsburgh, located in the town of the same name, in proper style. Another 125 servants tended the grounds and dairy farm. Since they had four other homes - on Fifth Avenue in New York City, in California, in Paris, and, more locally, the Ocean View mansion in Newport - they only spent from mid-September through December at Staatsburgh. Today, a 25-foot Christmas tree dominates a reception hall lined with portraits indicating Mrs. Mills' lineage when visitors first enter the mansion. The Mills' daughter Gladys married Henry Carnegie Phipps, and other daughter, Beatrice, became the Countess of Granard when she married Bernard Forbes. Their son, Ogden Livingston Mills, married and divorced Margaret Rutherfurd, stepdaughter of William Henry Vanderbilt, and became Secretary of the Treasury under Herbert Hoover. He was the same age as, but had little interaction with, neighbor Franklin Roosevelt, whose politics led him to be considered a traitor to his class. Commodore Cornelius Vanderbilt amassed a vast fortune in railroads and shipping and left an estate worth $105 million - more than was in the United States Treasury at the time. Most was left to son William Henry, who doubled it (equivalent to $3 billion today) by the time he died eight years later, making him the richest man in the world. His children built the most extravagant homes in America at the time, and entertained on a grand scale. Frederick Vanderbilt built one of his magnificent mansions in Hyde Park near his friends, the Mills. His was the ultimate Gilded Age country place with rooms reminiscent of Versailles, built at a staggering cost of over $600,000 in 1899. The decorations and furnishings are mostly from French or Italian royal palaces, and cost over $2.25 million. Frederick's older brothers Cornelius II and William built even larger homes in Newport - the Breakers and Marble House - and younger brother George had the grandest home of all - Biltmore, in Asheville, N.C.
Frederick had scandalized the family when he married Louise "Lulu" Torrance, a divorcee 12 years his senior who had previously been married to a first cousin. He was nearly disinherited and bequeathed a paltry $10 million. However, he went on to amass more money than all his siblings combined. He left his estate to Louise's niece, who arranged with then-President Roosevelt to sell the mansion and furnishings to the National Park Service for $100. The formal gardens and magnificent grounds of the Vanderbilt Mansion Historic Site have been restored to their 1930 appearance and are open daily to all. In Poughkeepsie, catch a holiday performance like "The Nutcracker" or "A Christmas Carol," the classic tale of Victorian-age social injustice and redemption at the Bardavon Theater, 35 Market St., an 1869 Opera House with superb acoustics that has hosted legendary names like author Mark Twain and politician William Jennings Bryan, and more recently, Dizzy Gillespie, Roberta Flack and Cher. After the show, bundle up for a 1.25 mile walk across the Poughkeepsie-Highland Railroad Bridge, which opened Oct. 3 as Walkway Over the Hudson. Standing 212-feet above the river, this popular attraction is the world's largest pedestrian bridge. Take in more art with free admission to the wide-ranging collection at the Frances Lehman Loeb Art Center at Vassar College. Don't miss the Hudson River School of Art collection given by Matthew Vassar when the school was founded. Rhinebeck, N.Y., becomes enchanted with the Old Dutch traditional holiday festival Sinterklaas in a downtown aglow and reminiscent of a holiday movie. Sinterklaas is topped off by colorful street performances and a children's starlight parade of puppets, music, dancers, glowing handmade stars and costumed children with hand-decorated crowns and branches. Savor some of their best or learn from the pros at the top-ranked Culinary Institute of America, housed in a former Jesuit Seminary in Hyde Park. Dine at one of five award-winning, student-staffed, on campus public restaurants, take a public tour, given by current CIA students, or do some holiday shopping for cookbooks and culinary wares at the CIA store. You can also learn to prepare holiday dinners with ease. The institute offers classes for all skill levels, not just aspiring professional chefs. If you want take your passion for food to the next level in a professional kitchen with award-winning chef-instructors book early. Classes on weekends feature lessons from from the pages of CIA cookbooks. On weekdays, you'll learn the why as well as how at Boot Camp, where recent students included an 83-year-old dentist, a German computer scientist, a family of seven there for a learning vacation, and a mother and daughter from whom she was separated at birth, now both chefs and collaborating on a cookbook. You must dine at least once at the institute, where students approaching graduation show what they have learned under the supervision of master chefs. You'll get a taste of Tuscany at Ristorante Caterina de' Medici, authentic French cuisine with a contemporary flair at Escoffier Restaurant, or the finest regional specialties at American Bounty Restaurant. St. Andrew's Cafe offers casual fare made from locally- and sustainably-sourced foods. The Apple Pie Bakery Cafe is popular as a budget-friendly breakfast, lunch, early light dinner, or for festive treats for your holiday celebrations. Languish in luxury, savor the seasonal splendor and dine on delicacies in Dutchess County on your holiday vacation. When you get back you'll be able to dazzle your friends with stories of rubbing elbows with the Vanderbilts and your newly-acquired culinary skills. Bon voyage! Seekonk's Linda Fasteson writes monthly for Living Well. She may be reached for travel tips or comments at rolidakr@comcast.net. Hilia Jimenez moved to a small house in Edgewater 14 years ago. After arriving from Cuba in 1959 and residing in North Bergen and then Union City, she finds Edgewater a pleasant place to live. At 112 Undercliff in Edgewater, this three-bedroom condo, 4 1/2-bath condominium is being offered at $1.195 million. "It’s very safe," she says, petting the mischievous black Scottish terrier that has darted down the block ahead of her. "There’s lots of shopping nearby, and there’s a ferry. I used to take it every weekday into Manhattan. Now I’m retired." Gesturing toward her house, half a block from Edgewater’s main drag, she adds: "This neighborhood is very good. The only problem is, there’s a lot of traffic on River Road." Because Edgewater is on the narrow strip of land between the Palisades and the Hudson River, many homes are within shouting distance of River Road, which threads the length of the borough. But the river is never far from the east side of the road, offering broad expanses of water and sky, plus the dramatic view of Manhattan. The borough’s 3 1/2-mile waterfront is largely lined with walking paths, parks and several marinas, now occupied by boats wrapped for the winter in white plastic. The Edgewater Community Center, which maintains a full roster of programs for all ages, is in a large waterfront park with playing fields and a population of monk parakeets. These flashy green and yellow birds, believed to be descendants of birds that escaped from a damaged crate at Kennedy Airport in the 1960s, nest in the park and other places in the town, providing intermittent dashes of color in the sky. "People like Edgewater’s proximity to New York," said Tiffany Elia of Prudential Elia Real Estate in Fort Lee. "You can get there by ferry or bus very quickly. The ferry to 39th Street takes 13 to 14 minutes, and it’s 20 minutes to the World Financial Center. The bus through the Lincoln Tunnel to Port Authority takes about 30 minutes." For information on public schools in Edgewater, visit evgschool.org. Sources: New Jersey Treasury Department/staff analysis by Dave Sheingold; New Jersey Multiple Listings Service; City-data.com; cnnmoney.com: Best Places to Live. The ferries from Edgewater run only on weekdays, during commuter service hours. At other times, a bus conveys passengers to the Weehawken ferry, five miles away. Elia also notes the large number of restaurants and shops in the borough, which has five shopping areas between River Road and the shoreline River Walk. There are chain stores such as Ann Taylor and Pier 1, and supermarkets include Trader Joe’s, Whole Foods Market and Pathmark. A daily shuttle bus from Manhattan brings shoppers to Mitsuwa Marketplace, a Japanese complex featuring an array of Asian shops and restaurants. Just north of Edgewater is Fort Lee Historic Park, part of the borough of Fort Lee. Cliffside Park overlooks Edgewater from atop the Palisades, and North Bergen is to the south. According to the U.S. Census Bureau, the borough has a total area of 2.4 square miles, of which 1.6 square miles is water, leaving only 0.9 square miles of land. Much of the construction is, therefore, vertical. Although Jimenez lives in a neighborhood of neat single-family houses, the majority of homes for sale in Edgewater are condos and town houses, many of them looking out over the river. "Right now, two-bedroom, two-bath condos, priced around $500,000, are moving well," Elia said. "There are a lot of town houses being built that will be coming on the market at higher prices." According to the New Jersey Multiple Listings Service, Edgewater has 186 co-ops, condominiums, town houses and single-family homes for sale, ranging from $129,000 for a studio co-op to $2,895,000 for a four-bedroom, 5 1/2-bath town house with a hot tub, solarium, three terraces, balcony and Hudson River view, located next door to a marina. Moving up from the close-in suburbs to farther out? Downsizing? Moving from one part of town to another? E-mail Violet Snow at v_snow@earthlink.net. Several thousand villagers in the firing line of the Philippines' rumbling Mount Mayon volcano risk forcible evacuation unless they leave the danger zone, officials have warned. Scientists say the powerful booms emanating from the Southeast Asian country's most active volcano were an indication that a massive eruption may be imminent. The eerie glow of crimson lava could be seen oozing from the volcano overnight, and relief officials said farmers and other residents who have refused to evacuate also faced the danger of volcanic ash flow. "We will personally remove the residents who refuse to evacuate to their designated evacuation centres," Albay provincial Governor Joey Salceda said after volcanologists raised the alert level to four on a five-point scale. Giving new figures, Salceda said that roughly 1300 families were still in their homes within an eight-kilometre danger zone declared around Mayon. As a rule of thumb, officials said each family averages five people. About 8600 families have already taken shelter in government centres beyond the zone mandated around the 2460-metre volcano. The hold-outs include many villagers who do not want to leave their farms and livestock behind, officials said. But scientists underlined the growing threat of ash and lava cascading down Mayon's slopes owing to the increasing frequency of booms from inside the volcano, audible as far as 12 kilometres away. "We cannot say exactly when the hazardous eruption is likely to occur," chief government volcanologist Renato Solidum said in a television interview. But he stressed: "The important thing is the distance from the volcano. That is why it is important that people not be inside the danger zone." 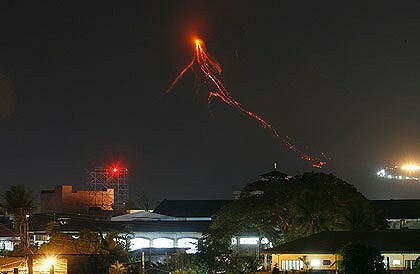 When Mayon last erupted in 2006, it oozed lava and vented steam for months. No one was killed by the eruption itself. But three months later, a powerful typhoon dislodged tons of volcanic debris that had collected on Mayon's slopes. The avalanche of mud and boulders crushed entire villages, leaving more than 1000 people dead. Mayon, renowned for its near-perfect cone, has erupted 48 times in recorded history. In 1814, more than 1200 people were killed as lava buried the town of Cagsawa. The film is set in a secluded cabin in the woods. It would be great if we could focus on an area close to Kingston - so that the stage would be close to the locations. This cabin is the place where the main character used to grew up and just moves back in years later with his own family when it became too expensive to live in the city. The cabin should look simple - nothing fancy and brandly renovated  and has to give the impression that the place hasnt changed since his childhood but used to be a nice place to live in when he was a child. It should look a bit rustic and with some charm but without a lot of furnitures though as no one has been living in there for years. o Ext. Dirt Road => rough dirt road with thick trees and a last stretch at the end that leads to the cabin. o Basement with 2 small high windows that are letting daylight in. - Ext. Hillside => little rise about 100 yards from the cabin. Edgewater — The future of the Hudson River walkway could be in the hands of local residents and the county. Stan Slachetka from T&M Associates, center, works out ideas on how to best proceed with the Waterfront Walkway with Edgewater residents and officials during a Dec. 9 workshop at the Edgewater Community Center. The Bergen County Department of Planning and Economic Development (DPED), with its consultant team, T&M Associates, and Neglia Engineering Associates, met with local residents Dec. 9 during the first of two community visioning workshops designed to reshape the future of Bergen County’s segment of the Hudson River Waterfront Walkway. "We’re going through a planning exercise that looks to provide linkages from the northern border of Hudson County [at North Bergen], through Edgewater and into Fort Lee at the base of the Palisade Interstate Park," said DPED Division Director Adam Strobel, who added it was premature to set a timeline or potential cost for the project. While the county hopes the meetings will help transform the waterfront’s history of contamination into a cohesive, linear urban park that can be enjoyed by residents and visitors, the Borough fully supports the effort. "The Borough of course loves the idea of the walkway and has always been amenable to improvements," said Borough Administrator Greg Franz. "I think the county planner is on target in stating we need some type of authority over the walkway." Also in attendance were Mayor Nancy Merse, Councilwoman Neda Rose and Councilman David Weschler. Although the first session was only attended by approximately 25 people, residents were not shy about sharing their ideas and concerns. Iris Borman, a Grand Cove condominium owner, said the site’s walkway, which is south of Whole Foods and north of Mariner’s Landing, has been raised three times and that no one could explain to her how to stop the erosion below the walkway. "It cost my community about half a million to put in a DEP [Department of Environmental Protection] approved walkway," said Borman. "We have been financially responsible for the walkway, which is continually sinking." Representatives from the county’s DPED said it was premature to say whether responsibility of maintaining the future segments of the waterway were transferable if the county built them, but took note of residents’ interest in that option. Leonia resident and Councilman Gil Hawkins, who was present of behalf of the Hudson River Fisherman’s Association, has been working with the state since the inception of the walkway. "We’re working as fishermen to keeping that access open, especially when these types of [condominium] developments are going on," explained Hawkins. "If the walkways aren’t done, people won’t be able to fish, fly their kites or walk. This has been going on for years." Other concerns included maintenance, repair and security along the walkway. Areas with gaps along the waterfront, which pose the greatest challenge of a linear walkway include the Hess Plant, various superfund sites and condominium sites such as Admiral’s Walk, which was grandfathered from the construction of the walkway because of piers and docks previously built on the site. Now, the county may be forced to reroute the walkway at that site and similar ones onto River Road. Mike Heanue, a resident of the Colony since 1967, who referred to a 1984 study titled, "Hudson Waterfront Walkway: Plan and Design Guidelines" published by the DEP, said the study, which specifies everything the walkways were supposed to be, has been ignored. "It [the waterfront] is not continuous. And the minimal requirements have not been met," insisted Heanue, a disabled Korean War veteran. "It was intended to parallel the water and to link existing parks and provide direct contact with all public waters. It doesn’t. It removes you from the water." Although Helen Manogue, president of the Hudson River Waterfront Conservancy (HRWC), doesn’t think the initial plan is viable as it was originally conceived, she does believe it is possible to address the more pressing issues. "One of the things this group [DPED] will be able to do is address the erosion problem," said Manogue, whose non-profit organization has been a voice for the walkway since 1988. Now HRWC, one of the organizations that helped spark the revitalization of the walkway, starting in Fort Lee, is working on a future GPS service which will provide users of the walkway with information on amenities, such as the nearest public parking available, regardless of a visitor’s location on the waterfront. "What we have to have now are rules and regulations on how do you do the underpinnings of that walkway. That’s one of the things that will have to be mandated by the state." There will be a guided hike with Christina Fehre on Sunday, December 20, meeting at 10 AM at State Line Lookout in Alpine (northbound PIP opposite Exit 3). Considered one of the prettiest spots in the Park, the "Peanut Leap Cascade" is an all-time favorite hike. Be prepared for some steep parts along the way, too, though splendid river vistas will inspire you to continue all the way down. The hike, which will cover about 4 miles round-trip distance in about 2 hours over moderate trails with challenging slopes, is a free program, open to all with no advanced registration required. For more information, or to confirm on the morning of the hike if weather seems questionable, please call 201 768-1360 ext.107. White Plains, NY - As we ring in 2010, it’s time to welcome the New Year in high style at a Hudson Valley celebration. Vivacious or quiet, there are many ways and many places to sing Auld Lang Syne along New York’s most picturesque river. If you’re dying to spend a unique evening, go to the DoubleTree Hotel in Tarrytown. You’ll never forget this New Year’s Eve when you mingle with the cast of characters from “Murder at the DoubleTree”. Dance, dine, and do some detective work as you witness a murder. Was it Miss Scarlett? Professor Plum? Gather clues at this overnight experience, and find out who did it at breakfast. Say goodbye to Father Time in grand style at The Thayer Hotel’s New Year’s Eve Party. Don your dancing shoes in your deluxe room overlooking the Hudson River, then sip a first class cocktail at the reception planned just for this event. Enter the dining room for a candlelight dinner, gourmet fare, and a live band that will have you dancing the night away. Sleep in, but don’t miss the breakfast buffet with all your favorites when you wake up in 2010.
hours, this is the Hudson Valley’s answer to Rockefeller Center. The rink is surrounded by gorgeous scenery, and the Trailside Zoo and Museums are just a short walk away. The region’s local animals circle the indoor carousel and you can sip some hot chocolate as you view snowy scenery from the glass enclosed pavilion. New Year’s isn’t just for adults, so take the kids to the Noon Year's Eve Celebration in Troy on December 31st. The Children's Museum of Science and Technology celebrates the arrival of 2010 with an animal show in the Operation W.I.L.D. exhibit. Kids participate in fun games and activities plus a parade. There’s a countdown to the Noon Year with a bubble blowing bonanza! Another terrific family event where you won’t need a babysitter is First Night in Millbrook on December 31st. Bring the kids to this charming village to walk the main street and see all the entertainment. Different genres of music from jazz to classical play throughout, while circus acts, marionettes, and magicians entertain children of all ages. Skiing enthusiasts will love Windham Mountain’s New Year’s Eve. Start the night in the Legends Lounge aprés skiing. When the kids get off the slopes, they can expend more energy jumping in the Bounce House, or interacting with the clown and magician. At 9 pm, whether you're inside or outside on the snow, watch the spectacular fireworks light up the mountain. Afterwards, young and old can dance until midnight with the rocking band, “The Nerds.” If you’d rather spend the last night of 2009 indoors, spend it in one of the gorgeous ballrooms of the Villa Barone Hilltop Manor in Mahopac. Their New Year’s Eve Gala features a smorgasbord cocktail hour with a delicious dinner of filet mignon and stuffed shrimp. Cha Cha or Samba your way to dessert with both a live band and a DJ. Unusual spaces are always great for parties and 11 North Pearl Event Centre in Albany is no exception. A magnificent art-deco bank building, the space lends itself to a festive New Year’s Eve party that includes live music by “Soul Session” and special performances. Cocktails, hors d’oeuvres and dinner stations lead up to the countdown and ball drop. From banks to bears, the Bear Cafe in Woodstock offers a prix fix package for New Year’s at this landmark Hudson Valley restaurant. A longtime favorite with celebrities, the cozy fireside settings offer views of the rushing Sawkill Creek. Dinner includes dancing next door at the Bearsville Theater where three DJs will have you dancing all night. Perhaps you didn’t get exactly what you wanted for the Holidays. In that case, head for Copake on January 1st for the 30th Annual New Year's Day Americana Auction. The Copake Auction House is filled to the brim with 18th and 19th century furniture, art, textiles, weathervanes, folk art, and period accessories. Happy New Year! The Hudson Valley ushers in 2010 in grand style with so many different places to celebrate. New Year’s Eve Gala, Villa Barone Hilltop Manor, Mahopac. 845-628-6600, www.villabaronehilltop.com. Hudson Valley Tourism, Inc. is the 10-county region designated by I LOVE NEW YORK to promote tourism for the area. Counties include Albany, Columbia, Dutchess, Greene, Orange, Putnam, Rensselaer, Rockland, Ulster and Westchester. Regional information can be obtained from any of the county tourism offices, the Hudson Valley Tourism website,www.travelhudsonvalley.com, or by calling 845-615-3860.